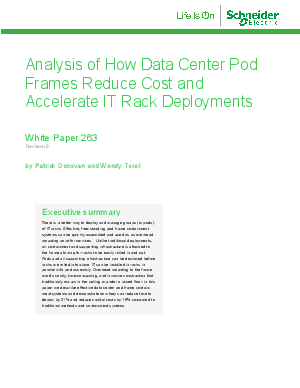 There is a better way to deploy and manage groups (or pods) of IT racks. Effective, free-standing pod frame containment systems can be quickly assembled and used as an overhead mounting point for services. Unlike traditional deployments, air containment and supporting infrastructure is attached to the frame allowing for racks to be easily rolled in and out. Pods and all supporting infrastructure can be deployed before racks are rolled into place. IT can be installed in racks in parallel with pod assembly. Overhead mounting to the frame avoids costly, time-consuming, and invasive construction that traditionally occurs in the ceiling or under a raised floor.